As a food writer, I’ve had the good fortune to eat in some of the world’s best restaurants. And yet, some of those dining experiences sucked. That’s because dining out is more than just about food. The most clever, creative and mouth-watering cuisine simply doesn’t matter if other elements of the dining experience are out of whack. I can tolerate lousy ambiance; some of my favorites eateries were essentially devoid of décor and design. But I can’t tolerate lousy or even mediocre service. Nothing ruins a perfectly good restaurant meal like careless (as in “I couldn’t care less”) service. And so, I often find myself gravitating not to the most cutting-edge restaurants, but the ones with good food and the type of hospitality that actually makes me feel valued as a customer. One such establishment is the Liberty Park area’s Pig & a Jelly Jar. Since opening in June, Pig & a Jelly Jar has already become one of my favorite spots for informal, friendly dining. 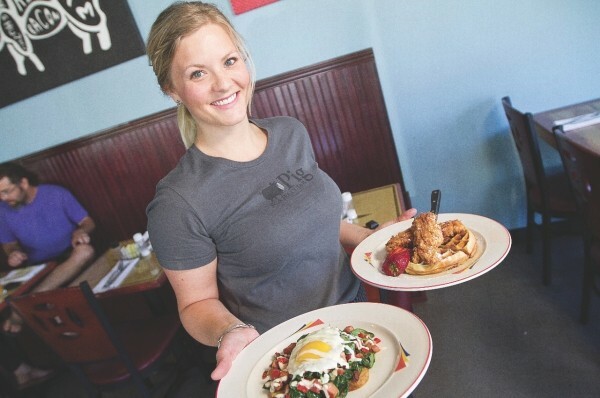 It’s the second restaurant of business partners Amy Britt and Jen Gilroy, and—like their first venture, Meditrina—the focus is on excellent food that isn’t overly contrived or pretentious. The “from scratch” menu at Pig & a Jelly Jar is focused on comfort food with a slight Southern spin. At Pig & a Jelly Jar, sausages, waffles, jams, ham hash, burgers, fries and just about everything else is made from scratch, with fresh ingredients. The fries, salad dressings and such didn’t fall off the back of a Sysco truck. As a result, food orders sometimes take a tad longer than in restaurants where things are pre-cooked. The friendly vibe at the restaurant, however, makes it a pleasant place to linger and chat or catch up on your reading. Daily breakfast and lunch are the backbone of Pig & a Jelly Jar, plus supper is served on Sundays. Breakfast plates, which are served all day, range from pig specialties like the awesome ham hash ($9) and housemade sausage breakfast (spicy Italian or chicken-apricot-rosemary with bacon or ham, two eggs and cottage fries for $8) to three-egg frittatas ($8 to $10) and housemade granola with oats, almonds, dried apricots, coconut, flax seed, fresh fruit and milk ($6). There are French, Mexican and Italian-inspired frittatas, the latter being a three-egg frittata with housemade spicy Italian sausage, provolone, red peppers, onion, basil and marinara sauce ($9). It’s an eggy version of classic Italian sausage and peppers. The clever French frittata features mushrooms, brie and caramelized onions ($9); there’s also the “vegetarian sink” frittata with tons of veggies and no meat ($9). Personally, it’s hard to pass on the chicken & waffles ($10), a somewhat refined version of the Southern classic, utilizing fried boneless chicken breasts (probably sacrilege in the South), hearty housemade waffles and real maple syrup. Another breakfast-time winner is the “pick & fix” Belgian waffle ($8). It’s a huge Belgian-style waffle with fresh fruit and a choice of two toppings: seasonal jams, cinnamon-cream syrup, maple syrup or pineapple lemon curd. The cinnamon-cream syrup is only slightly less addictive than crack. A word about Pig & a Jelly Jar service: It simply hits the right notes. Servers are well-versed on the details of the menu choices and, frankly, surprisingly knowledgeable about the wines on the eclectic wine list. Servers like Matt and Josh make dining at Pig & a Jelly Jar a warm and inviting experience—and, after all, how could I not love Josh’s Hunter S. Thompson Gonzo symbol tattoo? Lunch is mostly about soups, salads, sandwiches, burgers and grinders. The grilled-chicken salad ($9), a mixture of Cobb and romaine lettuces tossed with bacon lardons, tomato, hard-cooked egg and blue cheese, is excellent. Someone in the Pig & a Jelly Jar kitchen knows how to properly dress a salad. The greens are lightly elevated via the judicious use of dressings, not buried in them. Kudos to taking the less-is-more approach to dressing salads! I was a bit disappointed with the bland-tasting burgers, though. It’s obvious that they are made from scratch, but I would have liked more fat in the meat grind. The ground beef is dense and fairly dry, with hints of garlic but not much else—the opposite of a juicy burger. The crispy hand-cut fries alongside, however, were killer. Daily blue-plate specials ($9) include Italian meatloaf, shepherd’s pie, eggplant piccata, chicken potpie and fish & chips, but the menu and specials change often, so you never know quite what surprises are in store. One of the best dining bargains I know of is Sunday supper at Pig & a Jelly Jar. It’s similar to what they do at Ad Hoc in Napa, Calif.—a three-course prix fixe dinner with a set menu. And the price is astonishingly fair: $20 per person, plus tax and gratuity. Our Sunday supper kicked off with one of the best salads I’ve ever eaten. It was simple, but scrumptious: fresh spinach tossed with almond nuggets, apple chunks, dried cranberries, fresh grapefruit and tossed in what they called a “grapefruit vinaigrette”—although technically it wasn’t vinaigrette, since it contained no vinegar. However, it was a delightful, light dressing that knocked my socks off. The main course was a heaping portion—2-inch-thick pieces—of roasted-chorizo- and bacon-stuffed pork loin, bathed in a deliciously spicy chile-tomato sauce, served atop thick slices of rustic roasted spuds. The apple cobbler for dessert was a bit of a mess, however, with tough, stringy apple peels destroying the dessert. But I didn’t really care because I’d enjoyed the rest of my Sunday supper and our stellar server so very much.